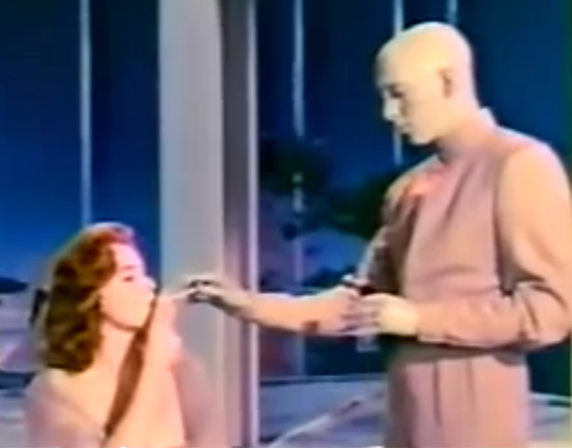 So proclaims the trailer for “The Creation of the Humanoids,” a wacko color sci-fi cheapie that can be insufferably talky and occasionally laughable, but not necessarily unwatchable. “Humanoids” has some fairly deep sci-fi concepts that lead me to believe its screenwriter, Jay Simms, either read, or wrote, a lot of short stories in those science-fiction digests so prevalent at the time. The setting is Earth following a devastating atomic war. Survivors develop humanoid robots (with bald heads, blue skin and sparkling red eyes) to assist in the reconstruction. Simple sci-fi so far, right? Okay, here’s where it gets a bit thinky: The robots are categorized by a series of numbers that reflect their proximity to human perfection. Stay with me. An R100 robot would be a perfect human. Got that? But it is illegal to improve a robot above an R70. A source of concern for some humans is that the robots have, of their own accord, been evolving up the “R” chain. These humans are afraid the “clickers” (a pejorative for robots) are developing a quasi-religion. Indeed, the robots call their recharging depot a “temple, ” and no humans are allowed on the premises. Concerned humans form an aggressive vigilante organization, the Order of Flesh and Blood. Meanwhile, a brilliant scientist (who later becomes a brilliant scientist’s essence in a robot body) begins churning out R96 robots. These, you realize (if any of this synopsis has clung to your brain), are a mere four points below human. And that’s the Cliff Notes version. A big problem: Most of these far out, albeit thoughtful, sci-fi concepts are communicated via the aforementioned insufferable dialogue. Characters talk and talk and talk. This will cause a lot of people to run screaming from “The Creation of the Humanoids,” but fans of cheezy sci-fi will consider it a gem. Two credits in the film must be made known. Buffs will remember Dudley Manlove, who plays a “clicker,” as Eros, the pudgy, imperious alien in “Plan 9 From Outer Space” whose infamous “stupid, stupid, stupid!” speech is a touchstone of schlock cinema. Manlove may be jowlier than in his “Plan 9” days, and painted blue to boot, but there’s no mistaking that ’50s TV pitchman voice. Having a “clicker” around to tend to your every need doesn’t seem like such a terrible thing, does it? Know also that the robot makeups are by Jack P. Pierce, the artist who created the looks for the Frankenstein monster, the Wolf Man, the Mummy and many other monsters in the Universal Studios horror classics of the ’30s and ’40s. In other words, he the man. 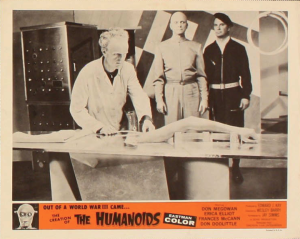 “The Creation of the Humanoids” was Pierce’s second-to-last film, and as such is required viewing for all Universal geeks, no matter how painful the experience. It is cinematic irony itself that the career of such a major player in the Universal classics intersected with that of a “Plan 9” cast member. Sleep with dogs, wake with fleas. 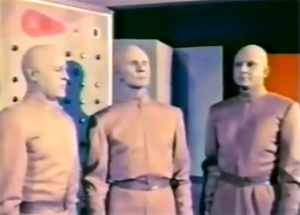 A cool thing: For such a low-budget film, “Humanoids” achieves a respectable “dystopian future” look. 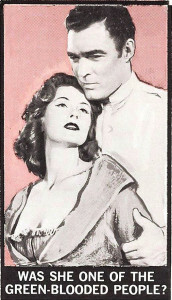 The film stock is a bit blurry, and favors reds and blues, but the sets and matte paintings are executed with care. This thing is worth a spin. And spin it, I did. 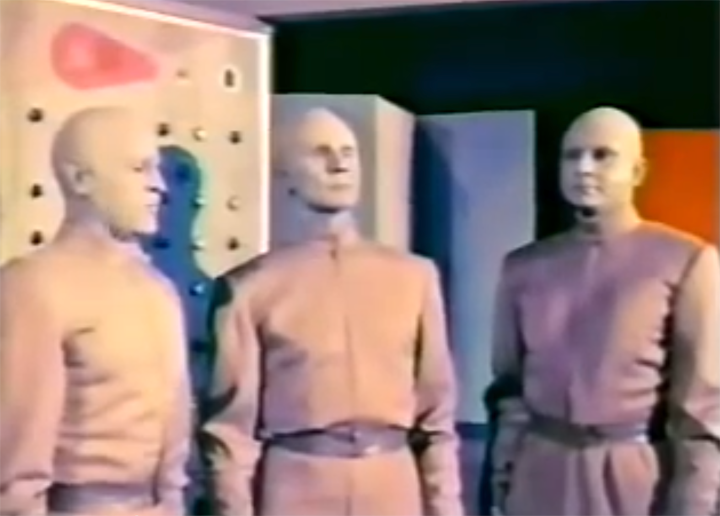 I binged hard on “The Creations of the Humanoids,” having watched it five times in a row. With each viewing, I gleaned new nuggets of information, which are imbedded deeply within the – here comes that word again – insufferable dialogue). Such as: Cragus (Don Megowan), the leader of the Order of Flesh and Blood, has an embarrassing problem: His sister is living openly with a robot. That’s right – they’re an item. (Cragus and his sister are both infertile because as children, they would sneak out at night and play in the atomic ruins, which glowed blue.) Then – spoiler alert – Cragus finds out that he’s a robot! And so is his new girlfriend! But with “a few simple operations,” the robot couple can have babies. I’m almost afraid of what I might pick up on the sixth viewing. 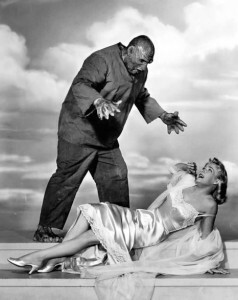 In the ’50s, dames always had on lingerie and heels when monsters attacked. And they were always blond. “The Creature Walks Among Us” (1956). 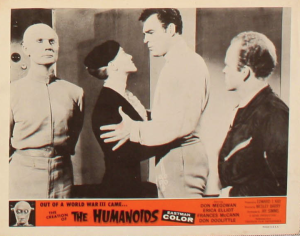 “Humanoids” was directed by Wesley Barry, who helmed 1950s westerns and was a child actor in silent films(!). 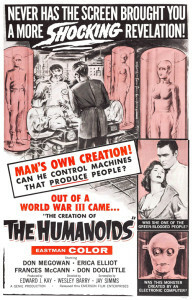 And “Humanoids” was the only film to be produced by Edward J. Kay, a prolific composer for the movies. Have you ever watched Monogram’s horror films or westerns or Bowery Boys movies, and noticed the odd musical themes and cues (often mismatched to the action)? Kay wrote ’em! Monogram buffs will recognize many of the 300-plus films Kay did music for: “The Ape Man,” “The Bowery at Midnight,” “Ghosts on the Loose,” “Revenge of the Zombies,” “King of the Zombies,” “Voodoo Man,” “The Face of Marble.” Kay was nominated for five Oscars, including one for – you’re not going to believe this – “King of the Zombies.” That’s right, a Monogram horror movie was nominated for an Oscar. Just knowing all of this adds another level of weirdness to “The Creation of the Humanoids.” As if it needed one.